Quick: name three bicycle brands. Didn't think of YT Industries, did ya? The two-letter abbreviation of Young Talent is the moniker of the German online consumer-direct company, which entered the U.S. market in 2015 as a certain chainstay pivot patent held by Specialized expired. Although a fresh face in the broad stroke the sport, YT with their "Good Times" tagline ponied up the euros to sponsor some of the biggest names on the mountain (including Aaron Gwin, Cam Zink, Andreu Lacondeguy, and the late Kelly McGarry), and in turn their bikes have been ridden to some of the most coveted and unique mountain bike accolades: the 2016 World Cup Downhill championship, a Red Bull Rampage victory, the Red Bull Rampage Best Trick, a U.S. Downhill National championship, and the Guinness World Record for the longest dirt-to-dirt backflip. 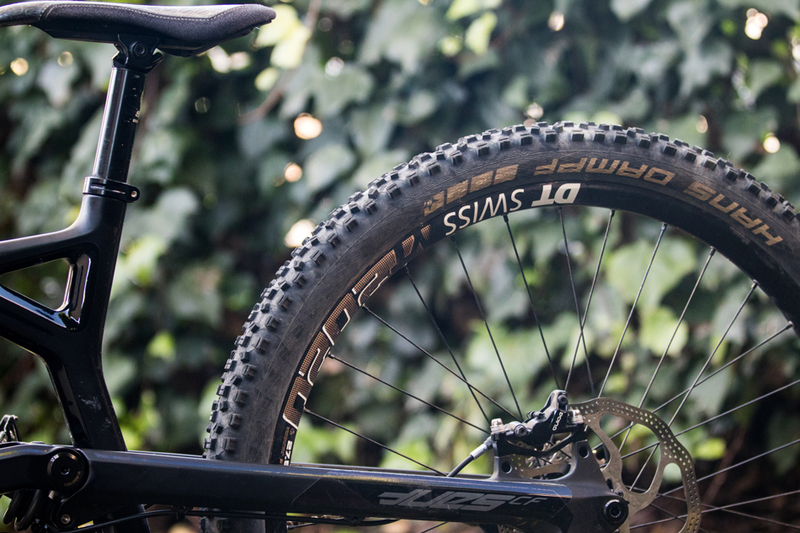 If you have the skills to repair a flat tire on the trail, then you should have the know-how and tools required to finish the remaining relatively basic assembly. That's an impressive list of talent and accomplishments, but what does YT offer to mountain bike mortals? To find out, I tapped their Tues CF Comp downhill bike as the platform to dangle a variety of downhill specific products from throughout the year. Pronounced "two es," and the bike’s name isn't an abbreviation for for the day after Monday–it turns out “Tues” means "do it" in German. The Tues frame is built around 650b wheels and YT's V4L four-bar suspension platform. It has 208mm (8.18 inches) of rear wheel travel, and is available in three models ranging in price from the alloy Tues AL ($2,299) to the top-shelf Tues CF Pro ($4,999), with the CF Comp falling in between at $3,499. The CF Comp shares the same carbon fiber frame as the flagship CF Pro, but instead of the Pro's spendy, air-sprung Fox Factory Series Suspension, 7-speed SRAM X01 DH drivetrain and carbon fiber e13 LG1R wheelset, the CF Comp dons a coil-sprung RockShox Boxxer Team fork and Vivid R2C shock, SRAM X9 10-speed drivetrain, and alloy DT Swiss 2020 wheelset. Out of the box, the size medium Tues CF Comp registered exactly 37 pounds on the scale. The stock DT Swiss YT 2020 wheels appear to be identical to DT's regularly offered FR 1950 wheelset. Regardless of what they're called, these things sure can take a beating, and have withstood a year's worth of poor line choice as evidence. The CF Comp frame features a carbon front triangle and seatstays, and alloy chainstays. Cable routing is external (other than inside the drive-side chainstay), but cables are nicely wrangled inside the front triangle for clean lines front to back. The rear hub spacing is 12×150 millimeters. 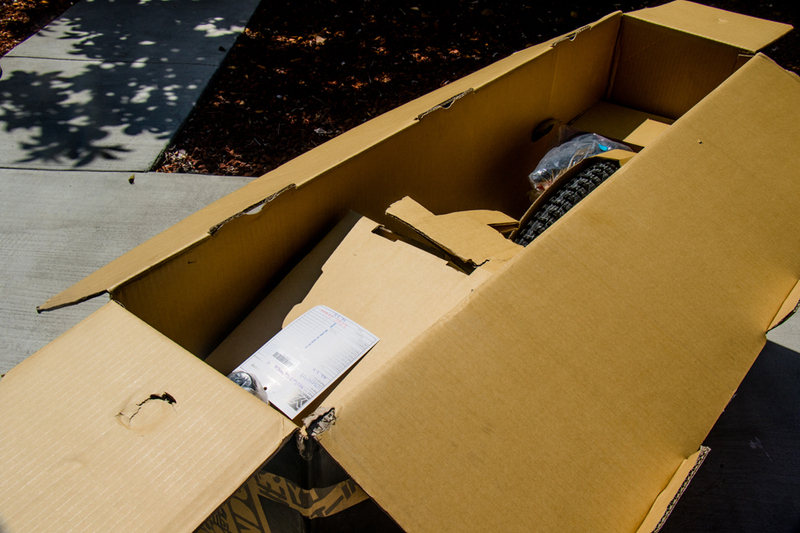 As an online consumer-direct company, YT doesn't have retail outlets, and therefore is able to offer complete high-end mountain bikes for considerably less than most well-known, brick-and-mortar-based brands. Customers won't have the option of consulting a local shop or quickly dropping by a dealer to kick some tires, but by cutting out the dealer, YT is able to sell complete bikes at a fraction of the cost of its competitors. For perspective, the Tues CF Comp reviewed here is currently offered online for $3,499, whereas a Specialized carbon Demo downhill frame goes for $4,000. The most affordable complete Santa Cruz V10 (with a lower-end spec than the CF Comp) will set you back $5,499, and to further break your brain, YT's complete alloy Tues AL ($2,299) downhill bike sells for about $500 less than a set of Enve carbon DH wheels. The SRAM X9, 10-speed drivetrain utilizes a short-caged rear derailleur to help keep it out of harm's way. You probably won't utilize the three lowest gears while riding the bike park, but they sure make putting around the parking lot easier. Available in sizes small, medium, and large, the CF Comp's key geometry stats include a 340-millimeter (13.38") bottom bracket height, 1,214-millimeter-long wheelbase, and a 63.5-degree headtube angle. Alongside the aforementioned components, the CF Comp comes race- or bike-park ready with 2.4-inch Maxxis High Roller II 3C tires, SRAM Guide RS brakes and an e13 LG1+ crankset and chainguide. 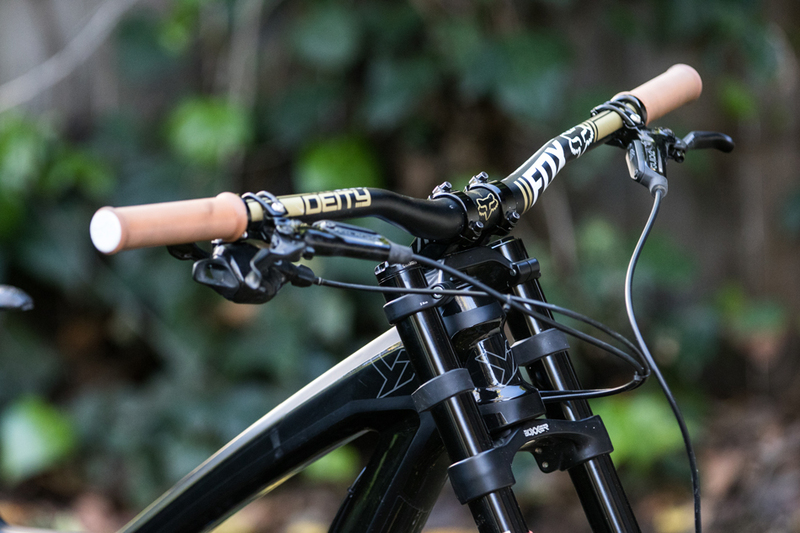 The cockpit features a Race Face Atlas handlebar and direct-mount stem, plus Sensus Disisdaboss grips. After a season of pounding the Tues CF Comp on a variety of terrain from Plattekill, New York, to Mammoth Mountain, California, the attribute which continues to stand out is how comfortable and stable the bike felt from the first ride. At 5'9" and 150-something pounds, I'm a rather standard-sized fella for a size medium frame, so it's no surprise it fit me pretty well. After the standard preliminary shakedown of brake-lever positioning and suspension sag setup, the Tues rode like a trusty machine I'd owned for years, allowing me to focus on the terrain ahead rather than wonder how the bike would handle challenging sections. 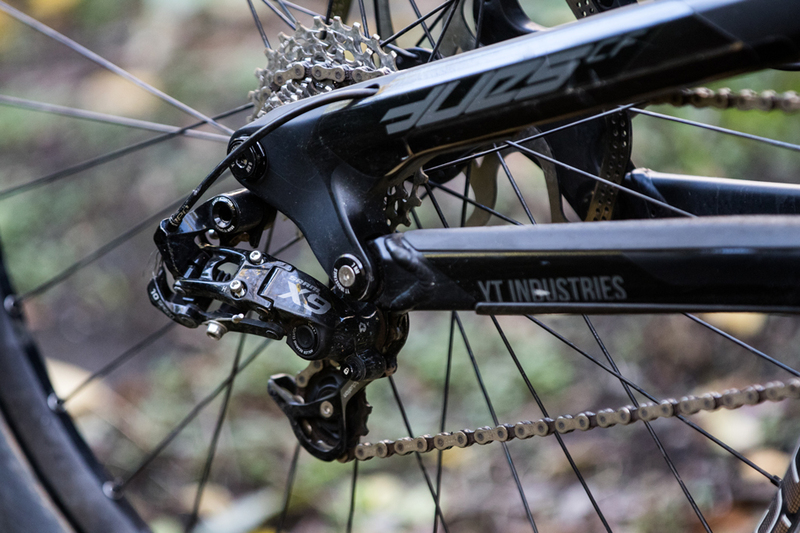 A lot of brands utilize the Horst Link chainstay pivot and four-bar suspension design, however YT's V4L linkage arrangement gives the Tues a very low leverage ratio that creates a stable and planted feel on rough downhill tracks. The rear-end of the bike is so supple that I found myself running most to all of the Vivid R2C shock's low-speed compression damping to reduce the wallow in berms and on jump faces, allowing me to maintain a centered riding position. The Tues is an agile handling downhill bike, but it truly shines on high-speed and rowdy terrain. 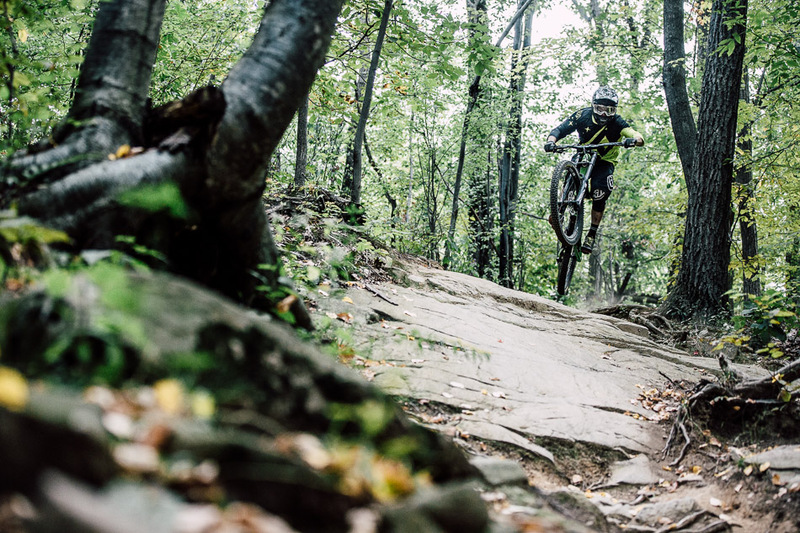 The balanced front and rear suspension and low leverage ratio help the bike maintain traction on steep and loose trails, while the rear end ramps up nicely to absorb those harsh, full-travel-worthy impacts. 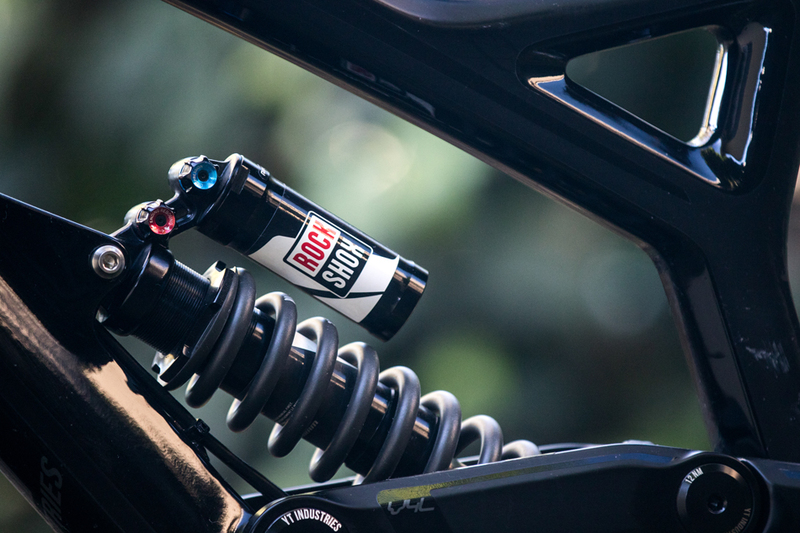 The long (10.5×3.5″) RockShox Vivid R2C shock and V4L suspension design provide a very low leverage ratio, which allows the rear end of the bike to be very active and supple. I mentioned how comfortable I felt on the Tues straight out of the box, and that's true. However, I had some personal fine-tuning challenges with the front-end and Race Face cockpit bits. The handlebar has a 35mm rise, the headset uses a 15-millimeter spacer underneath the fork's top crown, and the direct-mount stem has two additional 5-millimeter risers underneath. This setup was fine on super steep trails, but I was having issues getting my weight and body position over the front end for hard cornering and more aggressive handling situations. Ultimately, swapping the Race Face bar for a 10-millimeter-lower Deity handlebar, ditching the 15-millimeter cone-shaped headset spacer for a zero-stack version, and removing the stem risers lowered the front-end into my happy zone. To shift my weight over the front end, I lowered the cockpit height by swapping the stock 35mm-rise Race Face Atlas bar to a lower-rise Deity handlebar. Headsets are often like football's offensive linemen–they usually don't get mentioned unless something goes wrong. The stock Acros headset works fine, but it creaks and crackles like an old staircase. A few years ago, dropping $3,500 on a high-end downhill bike was possible—if you were okay with owning a used, year-or-two-old bike with likely no warranty. I've been running through my mind how to articulate in a brief amount of space the type of rider this bike is perfect for. However, the truth is that a great deal on an excellent-performing bike speaks for itself. Whether someone is an aspiring Aaron Gwin or a grizzled weekend warrior, grabbing a CF Comp for about half the price of a comparable build from a household brand leaves enough dough leftover for an extra set of 650b wheels, a season's worth of tires, or gas money for road tripping to a few of the country's finest bike parks.